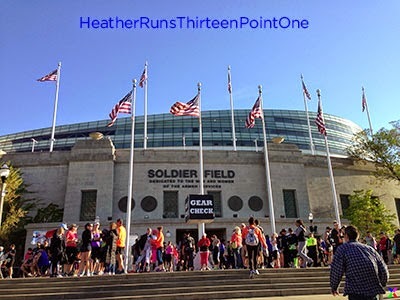 The Soldier Field 10 Mile took place on Saturday, May 24 at 7am. This was my first year doing race, since usually a week later is a half marathon I run, and I hadn't quite been ready for that in years past. 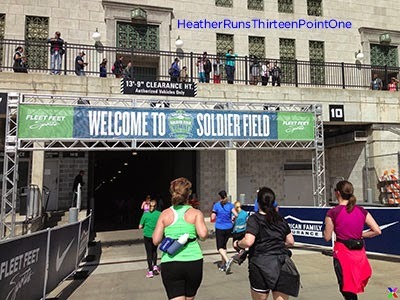 With Memorial Day being a bit earlier this year, I had an extra weekend without a race in order to regroup, so decided to sign up this year, a little last minute. I was excited to add this boy to my collection. Source. 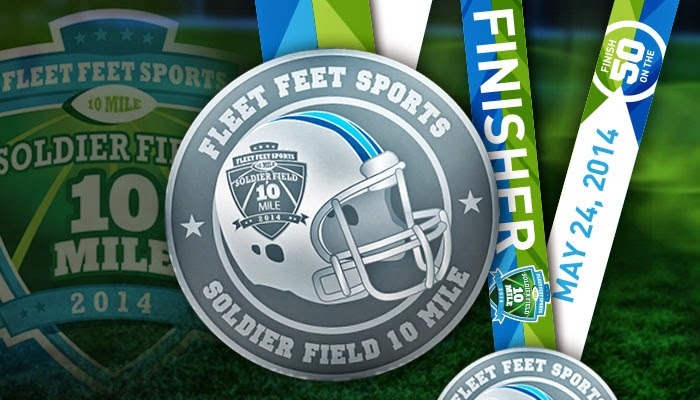 Packet pickup for the Soldier Field 10 Mile was being held the entire week prior to the race at Fleet Feet Sports in Old Town from 10am–8pm, Monday through Friday. I went on Thursday during my lunch break, and pickup, as usual, was fairly easy. The bibs were being distributed in the Piper Alley lobby-like area, and then the shirts were being distributed in the back of the store, which you could reach just a short way away from where the bib handout was. The only issue was that I had registered earlier in the week, so my number wasn't in with the rest of them, but in a different stack. However, it didn't take the woman too long to find it. 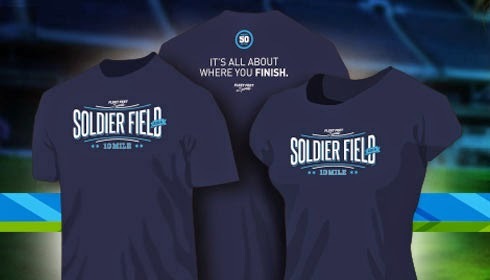 The shirts were pretty nice—Nike Dri-Fit, which I think is a must from a race. 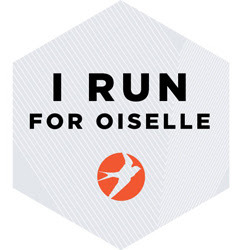 I wear my race shirts all the time for training, and even in other races. We also received a participant guide. I'd say size-wise they ran a little on the small size, and wish I had sized up. It was good enough that I didn't feel the need to exchange sizes, which I assume could have been done on race day, but am not sure. Saturday was an early wake up call at 4:30. My mom and I headed to Soldier Field and, for once, they had free parking! It was fantastic. 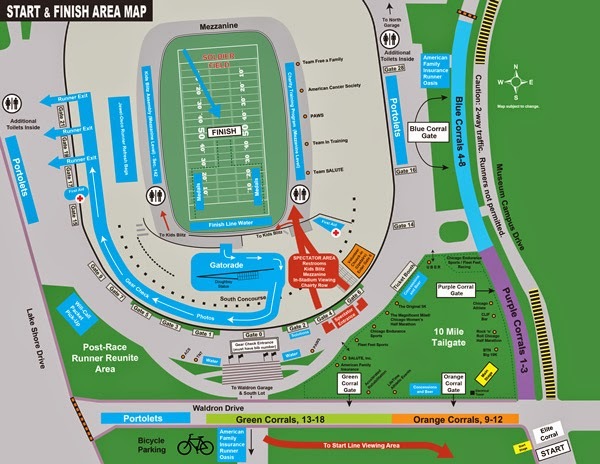 Most other races or events held here have a $20 (or more) parking fee. I thought with so many racers, parking might be an issue, but it was a breeze, with plenty of spots available. We got there approximately 30 minutes before the race start. Heading into the Green Corrals. The race began at 7am, with a wave start. 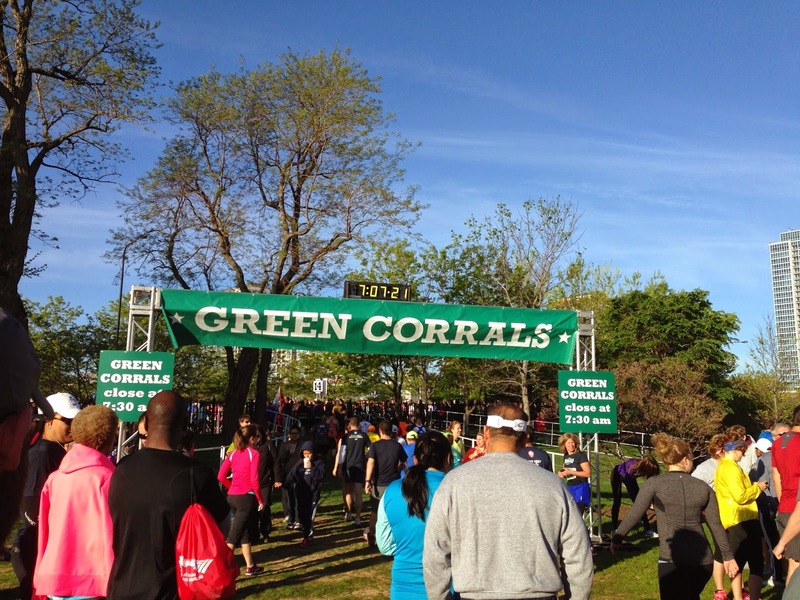 I had a green bib, which meant I didn't need to be in the corral until 7:30. 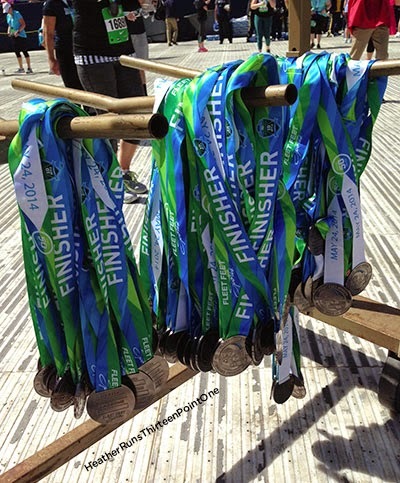 They had different entrances to the corrals for each bib color – Blue, Purple, Orange, and Green. Blue and Purple had to be in corrals by 6:45, Orange by 7:15, and Green by 7:30. Then, within each corral color group, there were sections in which you lined up by your number (i.e. 13,000–13,500 in one area—though I don't remember the exact breakdowns). My corral started at about 7:41. The weather was pretty perfect—sunny with a high of 61, though of course when I got started, I curse the sun and lack of clouds and wish for a breezier, cooler day haha. I think it was around mile 3 that I was feeling the heat. 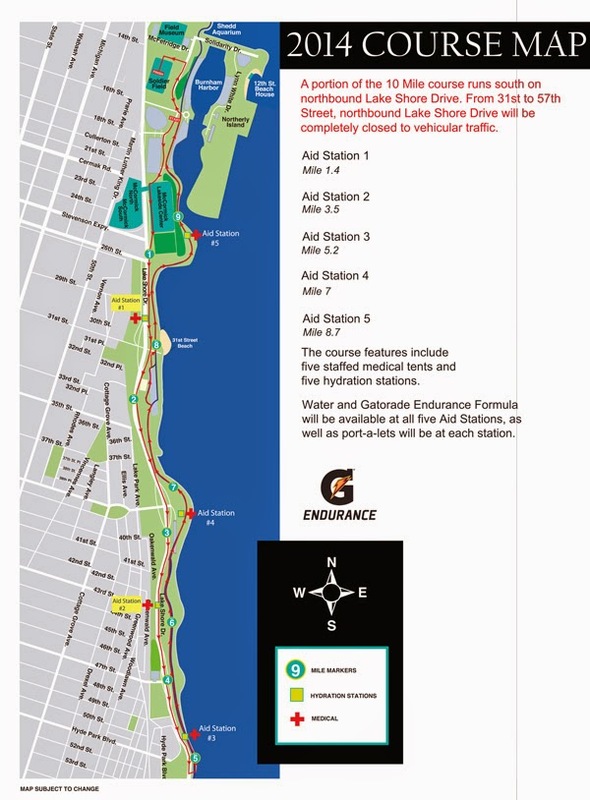 I ran 1/1 intervals, though some of them were broken up by aid stations, which were plentiful. They had 5 total, each having water, Gatorade Endurance, and port-o-lets and were located at mile 1.4, 3.5, 5.2, 7, and 8.7. 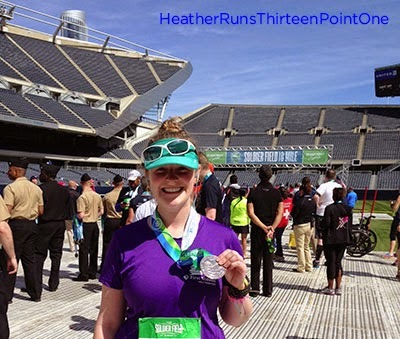 The course was a nice change – we actually ran on Lake Shore Drive for about 3 miles. 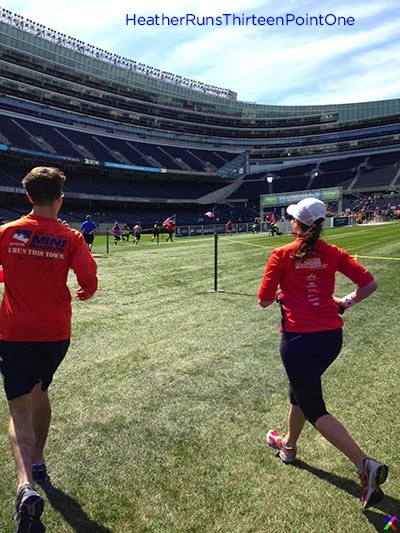 One thing I hate about some of the courses is having to run through the tunnel at McCormick Place, which unfortunately we did at this race. The ground is so uneven, and it's so dark, I'm always nervous about injuring myself. Not to mention when it's crowded and people are pushing their way around others. Beautiful view of the skyline. The turn around at mile 5 was through a patch of grass – there was some wood laid out to go up the curb so people wouldn't trip, and then we ran over grass to get to the lakefront running/biking path. Luckily, it wasn't a rainy day, otherwise that would have been a muddy/slippery mess. Another lucky thing was that we didn't have to go back under the tunnel by McCormick Place, since we stayed on the path. Yay! 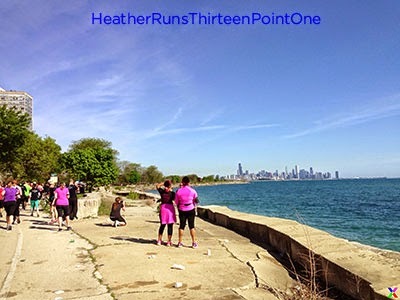 I love running back north, as there's a beautiful view of the skyline and we run past some harbors with boats. The water always looks so pretty and sparkly. I didn't have any ankle or knee pain, which was awesome, and I took a Clif Shot Blok at mile 7 when I started to feel a bit hungry. Heading into the player tunnel - exciting! Running on the field heading to the finish line! My favorite part of the race, of course, was getting to go through the players tunnel out onto the field for the finish. It's so cool to be able to run on the field to finish on the 50 yard line. I finished under 2:20, which was my goal. After crossing the finish line, military men and women were handing out the medals and water. I thanked them for their service and happily accepted the cool medal and a bottle of water. 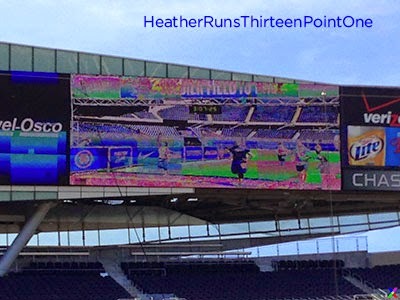 Friends and family were allowed to watch in the stadium, and the finish line video feed was on the jumbo-tron – pretty cool. Of course I was focused on finishing and forgot to look up briefly for the thrill of seeing myself up there haha. 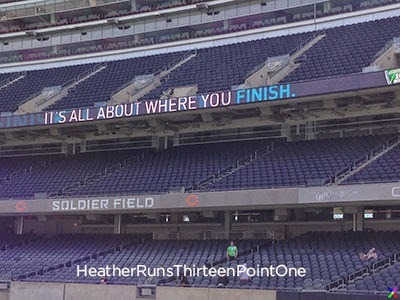 It's all about where you finish. Messed up picture at the time, but the Jumbo Tron! 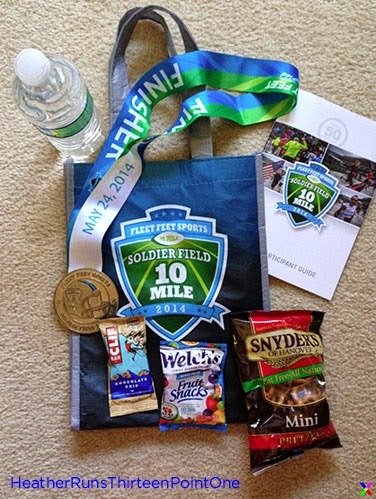 After receiving your medal, you walked into the stadium where you could get your photo taken, take lots of fun photos, and receive a bag filled with goodies. The bag was on of those reusable, plastic bags with a nice handle and velcro to close it – it was pretty sweet! Inside included a Clif Bar, fruit snacks, and pretzels. I think they might have handed out bananas as well, but of course I'm writing this more than 2 months later, I can't remember for sure (that's the problem with not writing them up right away! I really do need to get better at this...). When you left the stadium, the after post-race tailgate was being held on the grass outside. Goose Island was providing beer (each participant had a ticket on their bib redeemable for one beer). 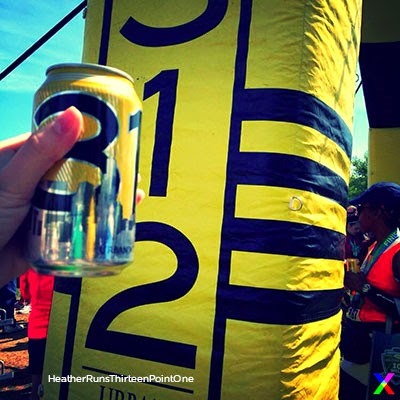 You could choose between either 312 Urban Wheat Ale of Urban Pale Ale. There were lots of vendors set up – mostly other races with information, and a band on stage. Hot dogs were being sold, as well as beer if you wanted more than the one, and Clif Bar was giving out samples - yum! It was a good time, and a beautiful day to hang out post-race and have a beer. 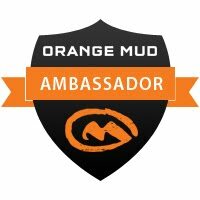 PS I've joined BibRave and added a review for this race. You can check it out here!